On 19 October 1988 Tory Home Secretary Douglas Hurd announced that organisations in Northern Ireland believed to support terrorism would be banned from directly broadcasting on the airwaves. The ban affected 11 loyalist and republican organisations but Sinn Fein, the political wing of the IRA, was the main target. It meant that instead of hearing Gerry Adams, viewers and listeners would hear an actor's voice reading a transcript of the Sinn Fein leader's words. Former BBC director general Lord Birt said the order came "right out of the blue". In the first weeks after the restrictions were introduced, the broadcasters were forced to interpret the new law themselves. This proved not to be a straightforward task. Danny Morrison, former director of publicity for Sinn Fein, said: "There was total confusion. I asked television and radio journalists, 'what can be done?'" Sinn Fein clearly believed that the broadcasting restrictions were an attempt by the government to silence its Republican campaign. Mr Morrison argues that "the ban as far as we were concerned was a weapon of war used by the government". However, the period leading up to the restrictions was one of the bloodiest episodes in the history of the Troubles and there was a strong feeling among ministers that something had to be done to stop Sinn Fein using the media to justify and defend the actions of the IRA. Former Tory chairman Lord Tebbit argues that "there was a lack of sympathy in the government towards the media at the time". He also believes the British public found the appearance of Sinn Fein leaders Gerry Adams and Martin McGuinness offensive after seeing TV pictures of IRA bombings which were killing dozens of people. 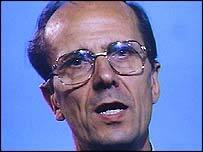 Lord Tebbit added the media was giving Sinn Fein and the IRA "publicity that they shouldn't have had". Democratic Unionist deputy leader Peter Robinson insists restrictions were "a legitimate weapon for the state to use". A list of actors was drawn up and would be called on, often at the last minute, to record voices for news and documentaries about Northern Ireland. The restrictions added pressure to the process of reporting events in Northern Ireland. There had always been a tension between the government and the media over coverage of the Troubles. BBC Reporter Peter Taylor recalled: "Throughout the 70s and 80s relations between the government and broadcasters had been getting worse and worse." Even before the restrictions were introduced there had been high profile struggles over particular programmes. This was highlighted in 1985 when the BBC bowed to government pressure and initially refused to show Real Lives: At The Edge Of The Union, a Paul Hamann film featuring Martin McGuinness. Mr Hamann argues that the film allowed "people to make up their own minds" about the Troubles by allowing Mr McGuinness and Gregory Campbell of the rival DUP to "tell their story, in their on way, using little commentary and no reporters". The initial banning of the film led to a 24-hour walkout by BBC staff. However, when the broadcasting restrictions were introduced in October 1988, the broadcasters realised they would have to find more subtle ways around the ban. The use of actors' voices and certain irregularities of the restrictions were highlighted when Peter Taylor made a film about the Maze prison, featuring loyalist and republican prisoners. The restrictions allowed Taylor to interview prisoners in their personal capacity without revoicing their contributions. However he had to revoice the section of the film when "the IRA's spokesman for food is complaining about the size of the sausage rolls". This demonstrated the surreal nature of the restrictions. 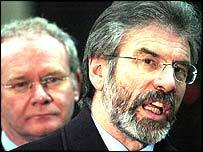 The restrictions were finally lifted in 1994 following the announcement by the IRA of a ceasefire. Now Sinn Fein communicates directly with the government and it seems improbable that such a restriction would be introduced again. The BBC's Ireland Correspondent Denis Murray explained: "Today the government would take soundings from the broadcasters and they would say, don't do this, it's not a good idea." However despite the apparent failings of the restrictions, controversy continues about the true nature of the relationship between Sinn Fein and the IRA and whether Sinn Fein should be allowed to communicate their arguments freely to the media. Speak No Evil - The Story of the Broadcast Ban was broadcast on 4 April 2005 on BBC4.